CellarTracker allows you to create nicely formatted wine lists that can be printed and kept in the cellar, shown to guests, or used for your own inventory purposes. This article describes how to create these printable lists, and how to customize their options. In our full desktop website, under the search box, select Quick Links, and then Print Lists and Labels. Or, click the Print button in the top right of the page, if shown. In our mobile website/app, click the logo at the top, switch to the My Cellar tab and scroll down to the REPORTS section where you will see a large button that says Restaurant Style Wine List. Select the middle tab, Restaurant Style Wine List. Customize the options to match your desired formatting. More information on each option is described below. 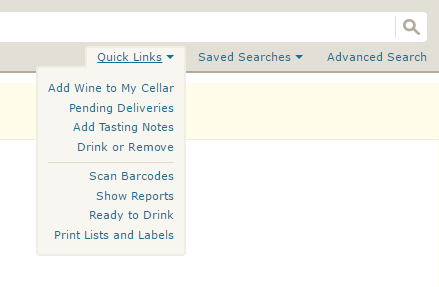 Click Preview to open the wine list in another browser tab. You can then print directly from the browser, save it to a PDF, or bookmark the page for future access. Tip: Save the restaurant-style wine list that opens when you hit Preview as a bookmark in your browser for quick access in the future. The link will remember all of your chosen options, and will refresh in real-time as your cellar contents change -- so each time you visit it, it will always be up to date! These options determine which wines are included in your wine list. All of my wines All wines in your cellar, including pending wines (futures) that haven't yet arrived. Only my delivered wines All delivered (in stock) wines in your cellar. Only my wines pending delivery All pending (futures) wines in your cellar. Only my wines in... 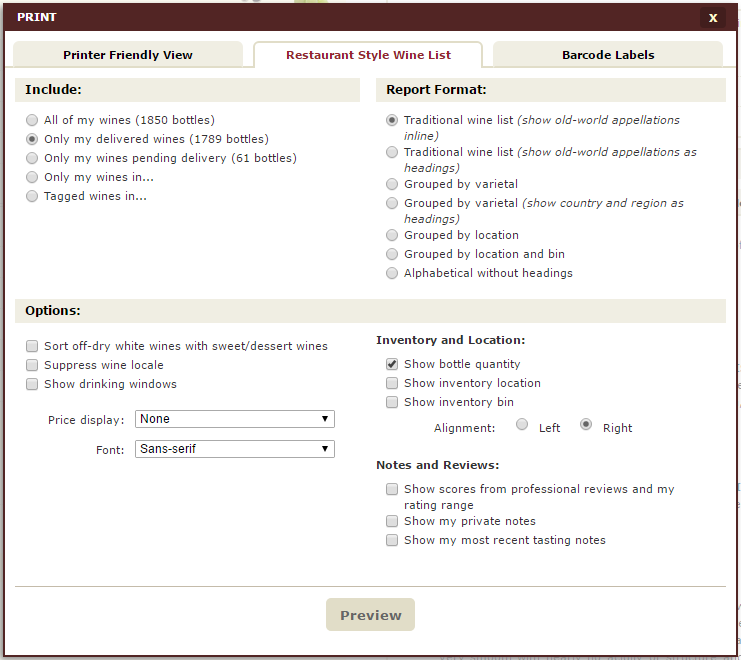 Include wines in one or more selected locations; hold Control when clicking to select multiple locations. Wines on my Wish List... Includes wines that are on one or more of your wish lists; hold Control when clicking to select multiple lists. Delivered wines on my Wish List... Includes wines that are on one or more of your wish lists and in your cellar; hold Control when clicking to select multiple lists. The report format specifies the high level organization of the wine list. See the associated examples for details on each type (using a restaurant's wine list as an example). You can further customize what information is displayed on the wine list by adjusting the settings in the bottom of the print dialog. Sort off-dry white wines with sweet/dessert wines If checked, off-dry white wines will be included under the Sweet/Dessert heading. Otherwise, off-dry white wines will be included under their own Off-dry Wines heading. Suppress wine locale If checked, locale details will not be shown next to the wine name. Show drinking windows If checked, drinking windows will be shown on the right edge of the row. Sort by bottle size If checked, wines will be sorted by bottle size within each heading, with the smallest bottles first. Sort by vintage If checked, wines will be sorted by vintage within each heading, with the oldest wines first. Price display Choose what type of price and valuation data is shown on the wine list. Suppress currency symbols If checked, the currency symbols for price/value will not be shown. Only a formatted number will be included. Font Customize the font used to render the wine list. Show bottle quantity If checked, the quantity of in-stock bottles will be shown in the list. Pending deliveries are shown in parenthesis. Show inventory location If checked, the location of the bottle will be shown in the list. Show inventory bin If checked, the bin of the bottle will be shown in the list. Alignment Adjusts the position of the quantity, location, and bin fields in the list. Left: Quantity, location and bin (if shown) are visible to the left of the wine name. Right: Quantity, location and bin (if shown) are shown on the right edge of the row. Show scores from professional reviews and my rating range If checked, any professional content channels which you have enabled, along with the community average and your own rating range, will be shown on the right edge of the row. Show my private notes If checked, and if you have entered a per-wine private note, it will be shown in the wine list below the wine. You can further adjust the alignment of the private note when this option is enabled. Show my most recent tasting notes If checked, your most recent tasting note (if available) for each wine will be shown in the wine list. You can further adjust the alignment of the tasting note when this option is enabled. Show my food pairing tags If checked, your food pairing tags (if available) for each wine will be shown in the wine list. This option only shows your own food pairing tags, not those of the community. You can further adjust the alignment of the pairing tags when this option is enabled.